I don't know about you but I'm itching to add some some brights, pastels and turquoise to my wardrobe in anticipation of some warmer temps. These are the items I'm currently crushing on and the best part? They're all $100 or less! love all these picks! esp that romper! That off the shoulder dress is exactly what I've been looking for! I love the flamingo clutch, too. Great picks! Literally all I've been adding is tropical and bright colors! So excited for the warmer days to arrive! 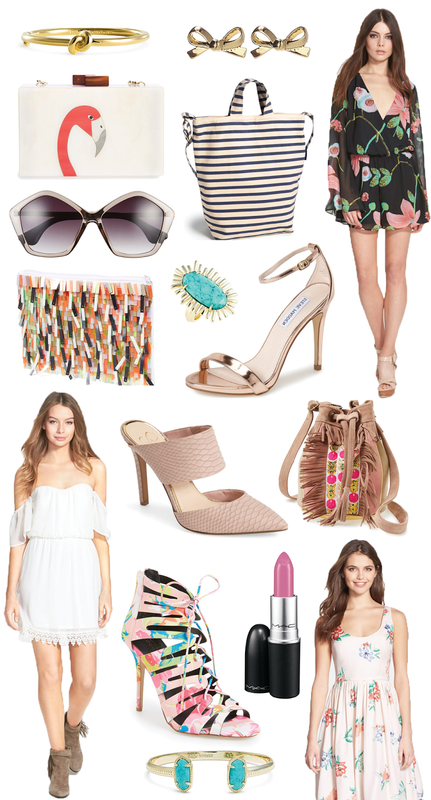 Loving that flamingo clutch- so cute! Great picks, love those gold bow earrings! SO in love with your blog! You are one of two bloggers that I follow every day! I have those Kate Spade earrings come to think of it. But I have no idea where I've put them. And that floral printed dress is absolutely stunning! Love that simple gold bracelet! Great finds!!! My fave is rose gold pumps! Great finds! Love the new layout on my iPhone!